It's been a number of years since I graduated from putting away all my Passover stuff haphazardly to putting it away purposefully, and I am grateful to see how much easier doing it that way made the following year's preparation. GET READY, START CLEAN. Starting with the last day of Chol HaMoed, stop using containers, decanters, tupperware, etc. and store leftovers in ziplocs. Or, store them in containers that you don't mind rotating into your chametz kitchenware. This way, there is never a Pesach container that inadvertently becomes chametz because you forgot to remove the contents, and you are not stuck with washing out tupperware after Pesach. Along the same lines, I always use disposable paper and plastic tableware for our last Pesach lunch. This way, I don't have a huge pile of dishes to attack right after Pesach. There are also a number of things you can probably start packing up, like your food processor, or crock pot, the seder plate (or anything that you use only for the seders). Right after Pesach ends, start with a clean kitchen and don't start ripping off foil and shelf liners yet. Wash and dry all the dishes, silverware and pots and pans. Put all the aluminum pans in the recycling bin. Wipe down all of your counters. TRIAGE, RECORD, DISCARD & STORE NON-PERISHABLES. Then take out all the food from your Pesach pantry and put it all out on the table. Make three piles: 1) save for next year 2) give away or discard 3) use for chametz. Next, you need to store the non-perishable food that you are putting away for next year properly and triage through the stuff that's old. When you are deciding what to save for next year, be brutal. Have you had that can of tomato sauce for more than two or three years? Rotate it into chametz, because you really don't want to be eating old food, and yes, even canned stuff degrades. I will save closed boxes of cake meal and matzoh meal, which I store in freezer ziplocs on a special shelf in my garage freezer year-long. I implore you not to save any cans that came from Israel (like Osem pickles or olives) because the cans from these companies cans start to leak or bulge after a year and that can give you a serious case of food poisoning, so rotate those into your chametz pantry right away. I give away non-gebrokts stuff I won't use to my gluten-free friends, who will make good use of it. Open potato starch can be used in Chinese food recipes (substitute for corn starch). Open matzoh meal and cake meal can be used for breading (mix with panko crumbs) or for making matzoh balls. Never, ever, store oils from year to year, even if not opened (unless you can keep them in a freezer). They can go rancid. This Harvard Medical School article on Drug Expiration Dates - Do They Mean Anything? Get out your laptop and record everything that you've decided to save for next year's Pesach in a spreadsheet. You don't need details, just something like : "2 cans cranberry sauce" will do. 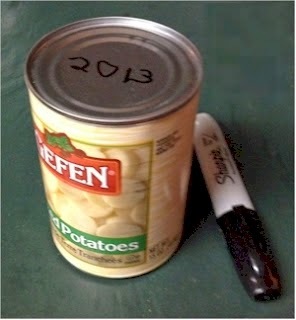 You will be so happy you did this when it comes time to make your Pesach shopping list next year. Whatever you're giving away should go in a box and put it in the trunk of your car now. Get it out of the way and out of the house. Wipe down your shelf liners from the pantry and label them on the back (3rd shelf, right side, etc., so that you can use them next year), remove them, and put back in the pantry whatever you're rotating back into chametz. WRITE IT DOWN! Make copious notes on what worked and what didn't this year, what broke, what you need to buy next year, what you bought too much of, what you should have bought, save recipes that were good, discard recipes that were not. Write down your menus, where you bought things, which store had the best prices on must-have items. Write the notes on your computer, not on paper, and save the file with the name Pesach Notes and then the year. That file is going to be a lifesaver next year. 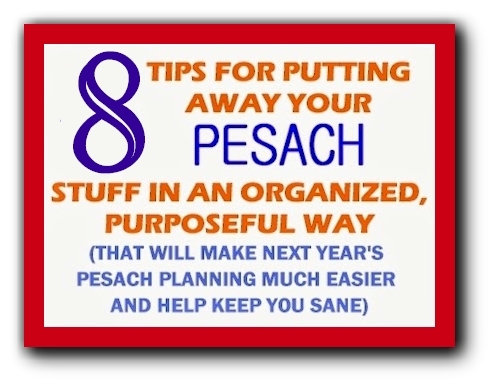 If you've never done this before and don't know where to start, download and print my basic Post-Pesach notes file here to help you get started! LABEL. As you put away your Pesach kitchenware, make sure everything is labeled for meat, dairy or pareve. Don't trust yourself to remember next year, especially on new things that you purchased this year. We use red, blue and white nail polish to label our kitchenware. If you have stuff that never got toveled or used, label it, so that you know that you need to tovel it next year. THROW OUT OR GIVE AWAY KITCHEN STUFF YOU DON'T NEED. Get rid of those kitchen items you don't need or aren't working for you. As you're putting Passover stuff away, take your time and weed out all the items that you have no use for. Is there any reason to have 3 graters, none of which really grate all that well (been there, done that)? Wouldn't it be nice to have a can opener that actually opened cans? How much longer do you want to hold on to that broken mini-food processor? Is that cheap, non-stick extra frying pan that you bought last year peeling and not really usable any more? If you've got kitchen wares you'll never use, throw them out, donate them, freecycle them, bring them to Goodwill, but get rid of them. You'll recover storage space (and a little sanity), and ultimately, disposing of stuff that's not working for you always saves you money in the long run. STORE SMARTLY. These are non-food items that you should NOT put away for next year (unless you have unlimited storage space): paper/plastic goods like napkins, plates, cups, silverware, foil, plastic wrap, paper towels, sponges, ziplocs. Rotate into your chametz immediately. Some exceptions: we store coffee filters that we bought for Pesach with our coffee maker (one less thing to worry about next year). We also don't use disposable plastic tablecloths during the year, so I make a note of the quantity that I have left and store them as well. There are lots of disposable things that you might not use during the normal year that you can use for Sukkot (like looks-like-real plastic silverware), so set those aside. If you use a heavy-duty reusable plastic tablecloth, wipe it down perfectly (and then wipe it down again) before you store it, so that crumbs, sticky stains, etc. don't attract critters or bugs. Never store anything dirty, thinking that you'll deal with it next year. Make sure everything you store is dry. TRIAGE THROUGH PERISHABLES. Use up your perishables, freeze what you can or give them away. Go through the fridge, audit your produce and perishables and make sure nothing goes to waste. Things that typically get overboughts: eggs, romaine lettuce, matzoh, milk, potatoes, and onions. If you baked too much and don't like to keep fattening sweets around the house, send them to work with you or your spouse. You can freeze extra bricks of cream cheese and margarine. Don't wait until the end of next week to discover wilted produce and spoiled perishables in your fridge. CREATE A STARTUP BOX. This is something that I started to do last year, and what a lifesaver it has become! Create a Pesach cleaning/cooking startup box. This box or bin should contain everything you need before you even start your Pesach cleaning and kashering. What goes into mine? The sink aerator that we use only on Pesach, the pot I use to kasher the sink, my clean (wiped-down) re-usable shelf and refrigerator/freezer liners, the Pesach freezer ice cube bin, 10 pairs of disposable powder-free gloves, disposable plastic tablecloths (these are great for creating temporary chametz-free surfaces before you have finished your Passover cleaning), and a printout of my final Pesach notes, lists and menus. Make sure this startup bin is the last thing that goes into your Pesach storage and the first thing you can access easily, and label it "Startup Box." Have you got any must-do Passover pack-up tips that I missed? Tell me about them.